he seminar covered single riding rules as well as rules when riding in a group. Guest lecturer was Manuel Zaro, known as Manolo, lifelong H.O.G. member and H.O.G. Athena Chapter Safety Officer. He himself rides a Harley bike since 1995 and has been on a motorcycle for 40 years now. Manolo is an ex-military pilot from NATO, having had 1500 flying hours on Fantom II and 300 flying hours on AWACS. Presently, he is a certified Air Force lecturer. 30 H.O.G. Sofia Chapter members took part in the seminar. In a few consecutive modules, 45 minutes each, the participant have learned more about the preparation before riding, have been demonstrated more about the hand signals, have heard lots about roadway hazards and separation from group and have felt the emotional bond between the rider and his motorcycle on an all-new level. In the end all participants took a test all of them have passed. They were all awarded a certificate for participation and successful completion of the programme. A riding along the Podbalkan Road was a great opportunity for the H.O.G. members to practice all they have learned. 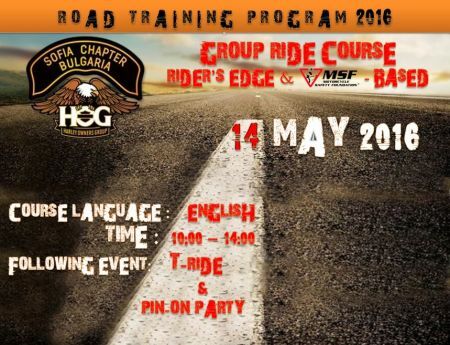 We from Harley-Davidson Sofia call upon more tolerance on the road.